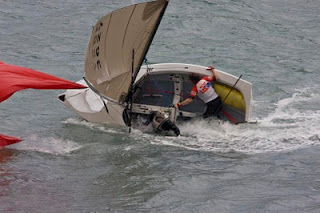 Tillerman at Proper Course asks what is the Worst Sailing Innovation Ever? No controversy about that, of course. The worst sailing innovation ever is the sail. In those halcyon days before the sail, boating was simple and pleasurable. People paddled their own canoes using short bits of wood or rowed gently down the stream with longer bits of wood. Boats went in direct lines from A to B and windless days were joyful. Then the Laziest Boater, Oh Best Beloved, worked out that he could get the wind to do the work. He took his best toga from his wife's washing line, hoisted it on a stick mounted in the bow of his dugout, pushed out from the bank and capsized. But that didn't deter him. He bailed out the boat, hoisted the cloth again and ran into the bank. And ever since then, men have spent all their spare time fiddling with uphauls, downhauls, vangs, preventers, lugsails, squaresails, foresails, trysails, genoas, spinnakers, gennickers, monikers and all get out to squeeze that extra ounce of performance from the rig. Then they run into the bank and capsize. On windless days they sit motionless in the middle of the lake, cursing, and when the wind is up they tack endlessly from bank to bank, cursing. No wonder the sail is universally regarded as the worst innovation ever. I love it! Mind you, I row and sail. So I guess I'm lazy 50% of the time. But I think the first sailor was a cyclist. The cyclist spends all of his time fighting the wind. When it's in his face, it's slowing him down and he curses the wind. When it's at his back, he still feels 'apparent' wind in his face, boasts about how strong he is feeling that day, and, again, curses the wind. When he first tries a sailboat, suddenly his nemesis the wind is doing all of the work for a change. Only a former cyclist would continue to put up with all of the grief the wind causes sailors. Inside, he will always feel he's beating his former nemesis. Cyclists have a lot in common with sailors - that itch to endlessly adjust their equipment in a futile search for perfection and the need to dress up in expensive specialist clothing come to mind. But cyclists are also addicted to mile upon mile of mindless, repetitive physical exertion so they are obviously related to rowers as well. I think the addiction to mindless, repetitive exertion is what leads us to blogging, too.